Spring Creek Hatchery State Park is located in the Columbia River Gorge National Scenic Area, in southeast Skamania County, along the Columbia River. Spring Creek Hatchery is a premier windsurfing and kiteboarding site in the Columbia Gorge with views of Mount Hood from the shore. The park sits at the entrance to the Spring Creek National Fish Hatchery which offers tours of the facility and other interpretive opportunities for visitors. 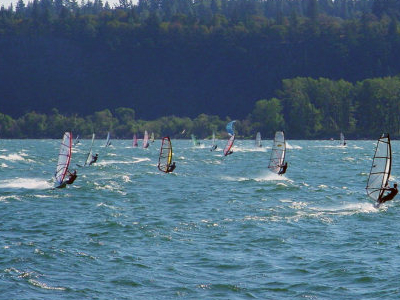 Spring Creek Hatchery State Park is one of the premier windsurfing and kiteboarding sites in the Columbia Gorge. A majority of visitors coming to the park do so for this type of recreation. The park also offers other traditional outdoor activities, including picnicking and fishing. When financial support is available,the park has played host to professional windsurfing competitions in the summer. Here's the our members favorite photos of "State Parks in Washington". Upload your photo of Spring Creek Hatchery State Park!